June 8, 2017 – Beijing, China – The international community is forging ahead in the fight against climate change through Mission Innovation: a commitment to accelerate innovation and make clean energy accessible and affordable worldwide. At its second global forum in Beijing, China, June 6-8, 2017, senior Ministerial delegates from 22 member nations and the European Union, representing more than 80% of the world’s public investment in clean energy research, came together with private sector investors, thought-leaders and innovators to discuss challenges, highlight progress, and explore opportunities for collaborative projects toward an affordable, low-carbon future. 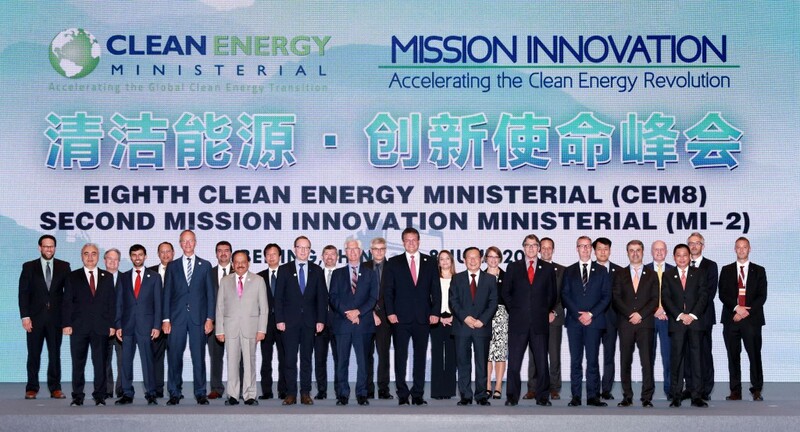 “Mission Innovation is becoming the leading international collaboration platform for clean energy innovation and transition,” said China’s Minister of Science and Technology, Wan Gang. Minister Wan Gang, evidenced China’s leadership in this area and graciously hosted the world’s innovators, along with his co-chair, the European Commission’s Vice President of the Energy Union, Maroš Šefčovič. Members celebrated progress that the Mission Innovation partners have achieved over the last year, welcomed new members, Netherlands and Finland, and a new collaborating partner, the World Economic Forum. “Mission Innovation is about global leadership in developing the clean energy landscape of the future, based on a collective commitment to accelerating the pace of clean energy innovation,” said Mission Innovation co-chair Maroš Šefčovič. In the Chair’s summary of the meeting, it was noted that a series of announcements were made by various Ministers on plans and progress being made on Mission Innovation’s focus-areas, coined as clean energy “Innovation Challenges”. In closing, the Chair and Co-Chair thanked the Ministers and Heads of Delegation for their continuing efforts to advance a low-carbon energy future, wished them well in advancing Mission Innovation’s Action Plan and acknowledged the group of Nordic countries, Denmark, Finland, Norway and Sweden, and the European Commission for agreeing to co-host the next global Ministerial in 2018.